I have always dreamed of visiting New York City. There is just something about the lights, the buildings, and the hustle and bustle that appealed to me. I’ve talked about this dream with my sister for years and one day she stopped me and said, “Let’s do it! 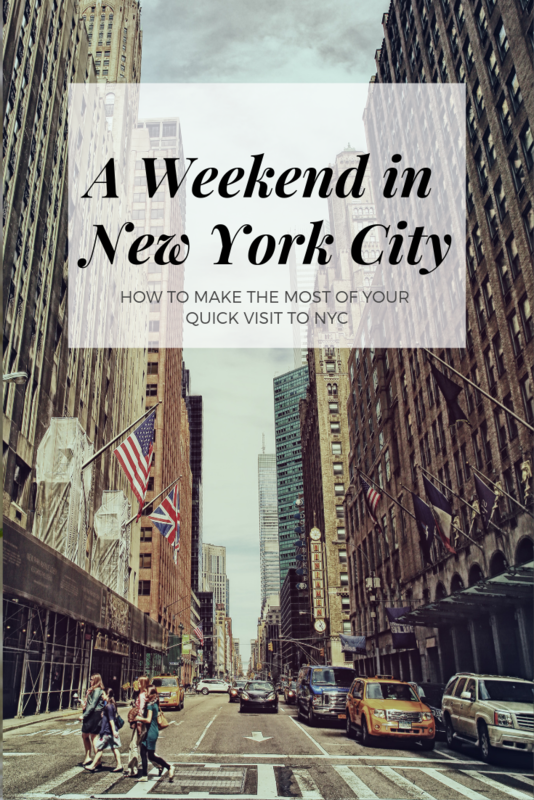 Let’s go visit New York City this year.” And I said, “Ok!” We decided to try to keep the budget low and to only visit for 3 nights, one weekend. We made our list of “must stops” and started planning. 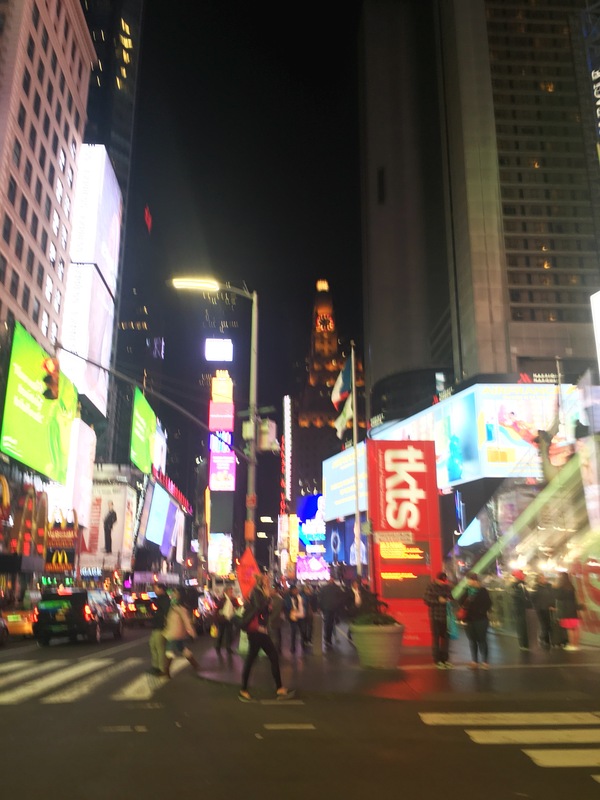 We arrived in NYC at around 6 pm and after checking into our hotel we hit the streets! –We booked our hotel Priceline. We found that they had the best deals (this is NOT sponsored!). We also used ebates which gave us an extra 6% off the price. We scored a boutique midtown hotel (with a king bed) for only $200/night. Our first stop was pizza at Uncle Pauls Pizza. The pizza was delicious and only $4/slice. Win, Win! After dinner we walked around and enjoyed sight seeing. 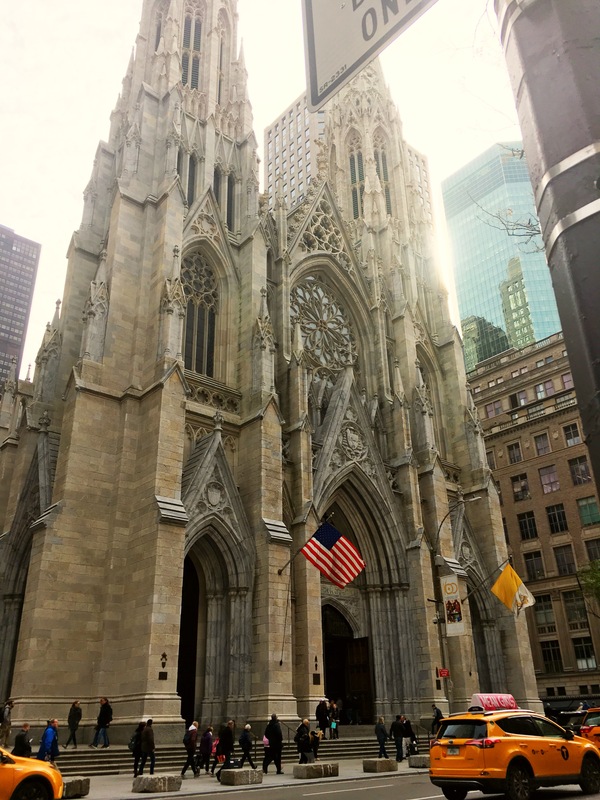 We visited Grand Central Station, St.Patricks Cathedral, window shopped down 5th Avenue, and ended the night in Times Square. Everything we saw Thursday night was completely free! Breakfast Friday morning was at Home Front Deli. This is a small little restaurant, but boy was it delicious! They made the best bagels I tried all weekend! I highly recommend! After breakfast we headed to The Metropolitan Museum of Art, or The Met for short. This was one of my favorite stops of the entire trip! It is WELL worth the money! 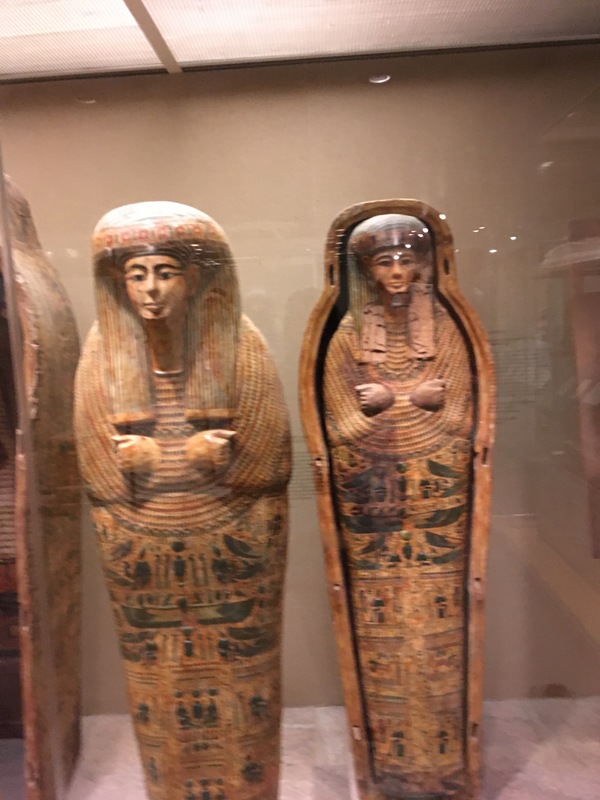 You could spend DAYS in this museum. 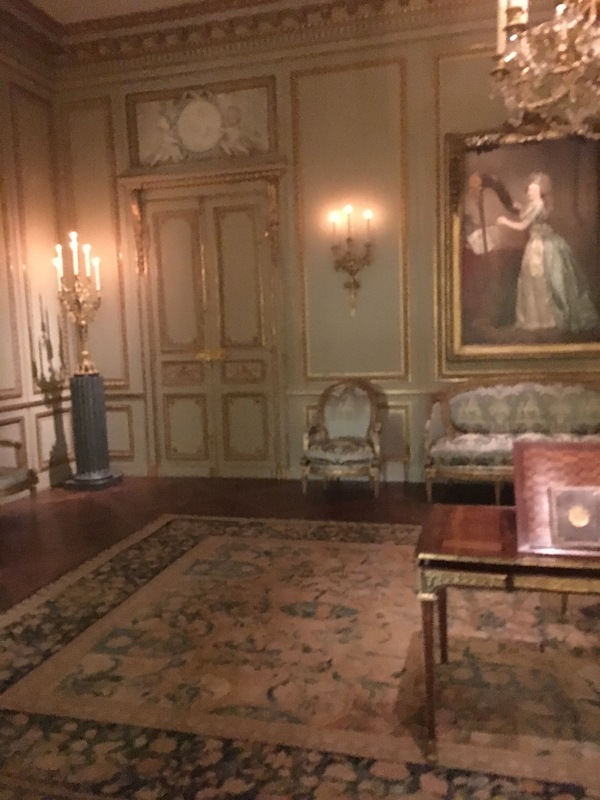 We focused on the Egyptian Room, The American Wing, and European Art. Everything was absolutely incredible! –To help on costs we bought the Explorer Pass. This was the cheapest option we found for us to be able to see our “must stop” places. We used it for The Met, Top of the Rock and 9/11 Memorial Museum. You can customize the Explorer Pass, enabling you to pick and choose the places you want to go. 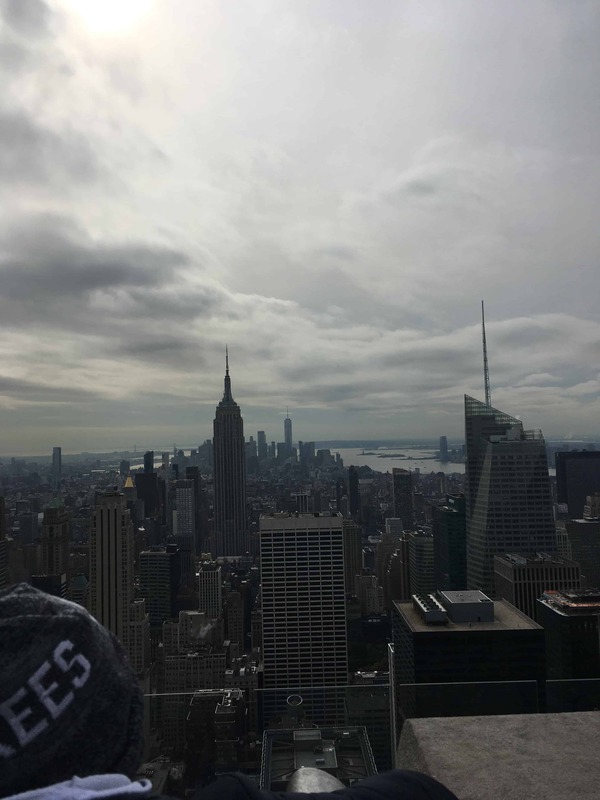 After The Met we rode the bus down to Top of the Rock and were treated to absolutely amazing views of New York City. 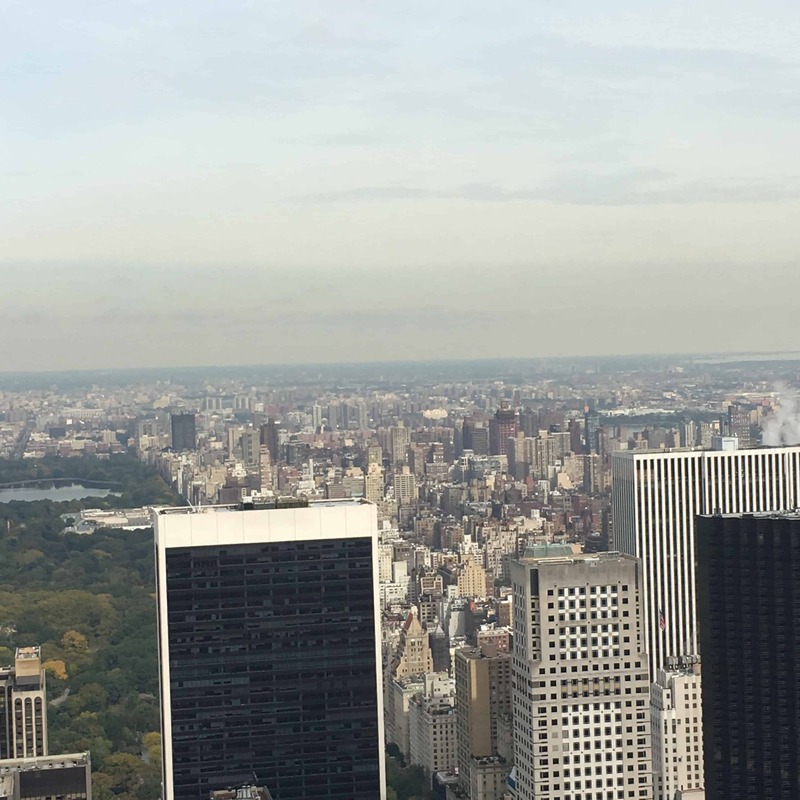 Going to the top of Top of the Rock is not only cheaper than the Empire State Building, the views are also better. 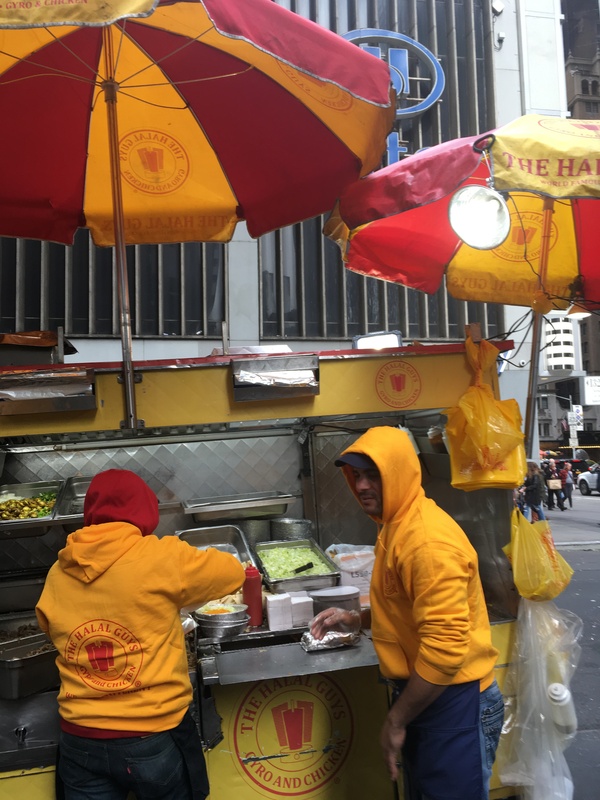 Next, was lunch at The Halal Guys for the best Gyros I have ever had. This is seriously a must stop. The portions was huge and only around $8 for a platter. That night we had tickets to go see The Lion King on Broadway. This was one of our big splurges for the trip and it did not disappoint! 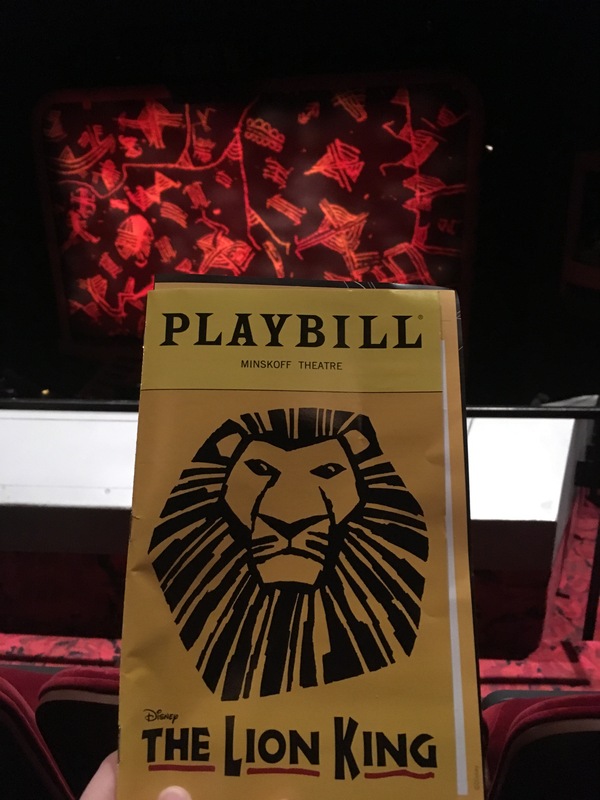 We paid full price for our tickets to The Lion King, but there are ways to get discount Broadway Tickets. —You can buy same day Broadway tickets at the TKTS booth located right in Times Square. These same day tickets are heavily discounted for a select shows. –For Hamilton tickets download the Hamilton app onto your phone. You can enter a lottery with the winner given the option to buy two Broadway Hamilton tickets for just $10 a piece. Warning: I have entered this lottery numerous time with no success! –Check out Today Tix for discounted tickets that can be bought in advance. We used this service for a Broadway show Saturday night and were very pleased with it! 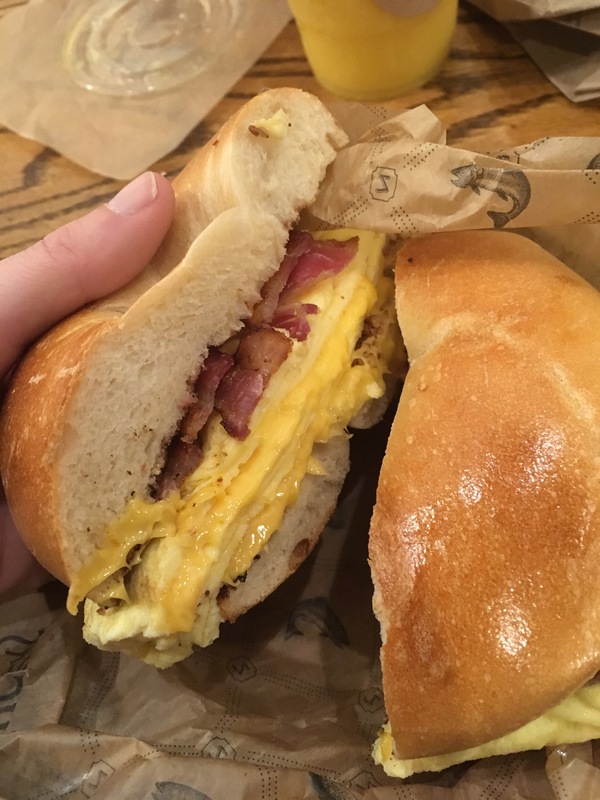 Saturday breakfast was at Zuckers Bagels. I didn’t enjoy this breakfast quite as much as Home Front Deli, but it was still really good! 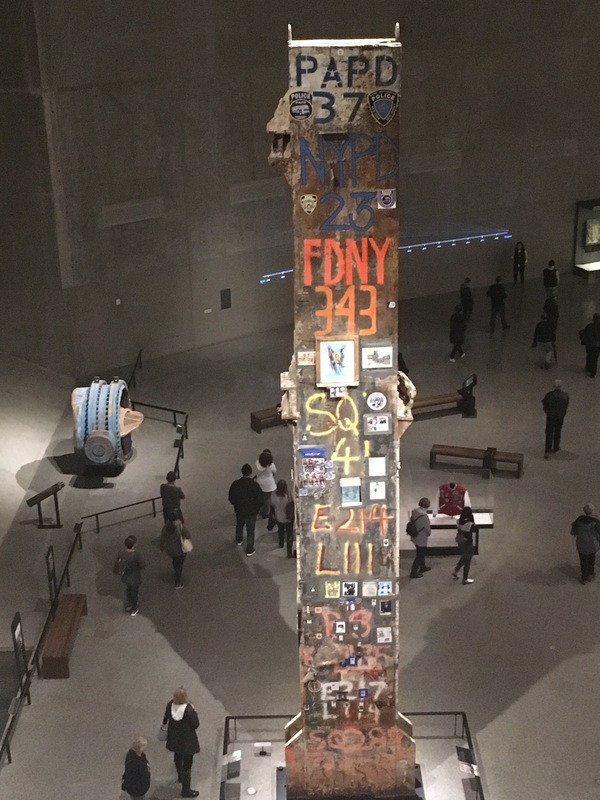 Immediately after breakfast we headed to the 9/11 museum. 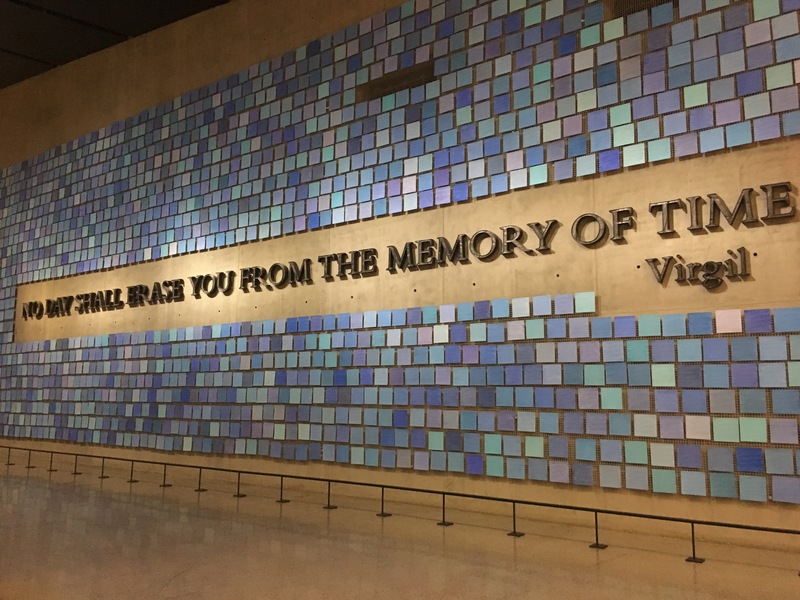 We were treated to an amazing museum full of heart wrenching photos, survivor stories and gut wrenching facts. We spent about 3 hours walking around and taking it all in. We honestly could have spent all day there, they had so many exhibits and information to look through. After the museum we headed Downtown to hop onto the Staten Island Ferry. This is a completely FREE ferry that takes you right past the statue of liberty. It was so simple to walk right on to the ferry. 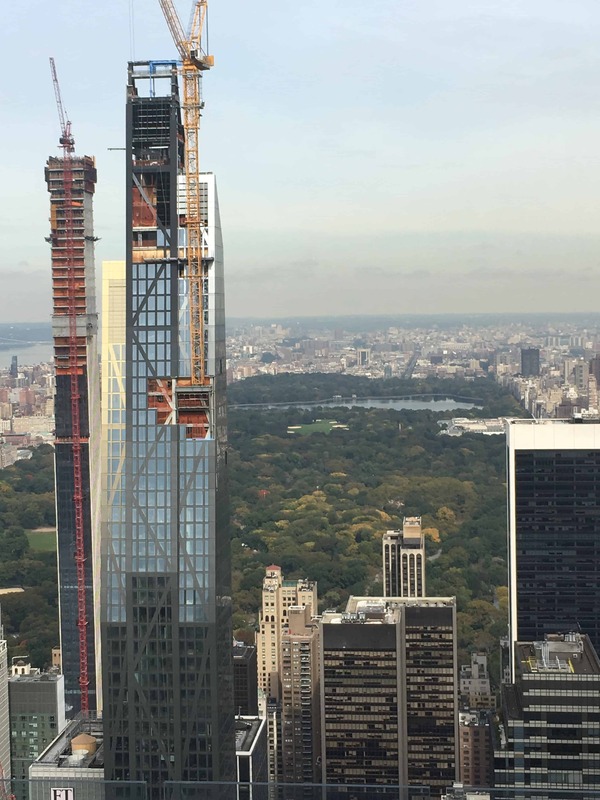 I recommend going to the very back so that you can also be treated to a view of the NYC skyline. The views of the Statue of Liberty were even better than we had expected! Once we arrived to New Jersey, we walked off, went around the corner and walked right onto the next ferry to ride back to Manhattan. This was really easy, and you just can’t beat FREE! 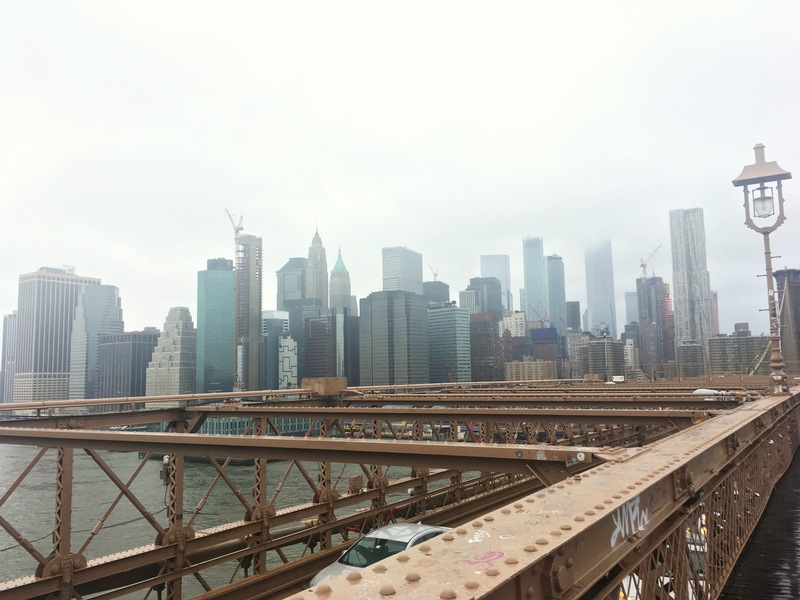 Next, we headed to Brooklyn for a walk across the iconic Brooklyn Bridge. 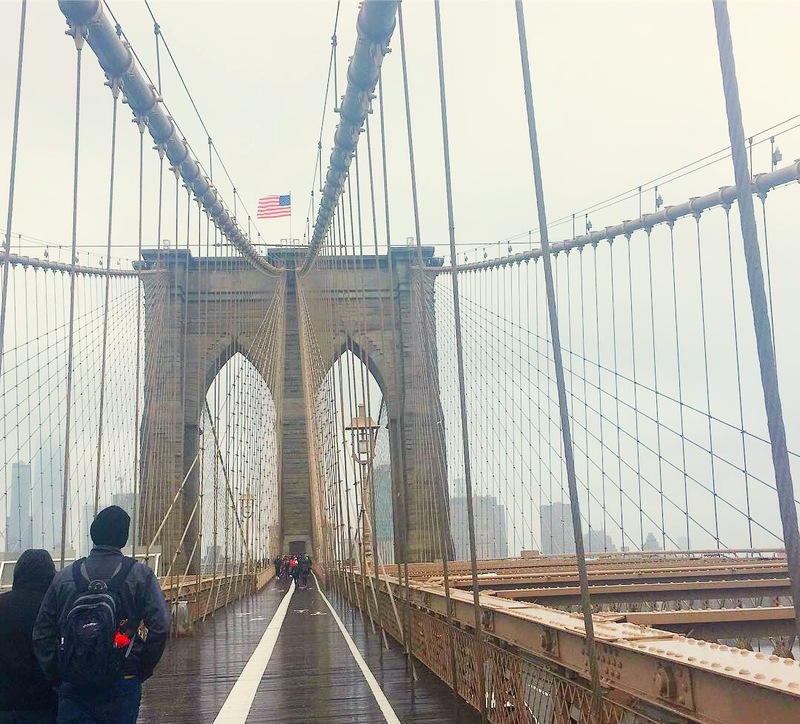 It was a wet and stormy day, but we still enjoyed the views on the bridge. The architecture was incredible! That evening we had dinner at The Melt. They make gourmet grilled cheese sandwiches. The food was amazing and very budget friendly! 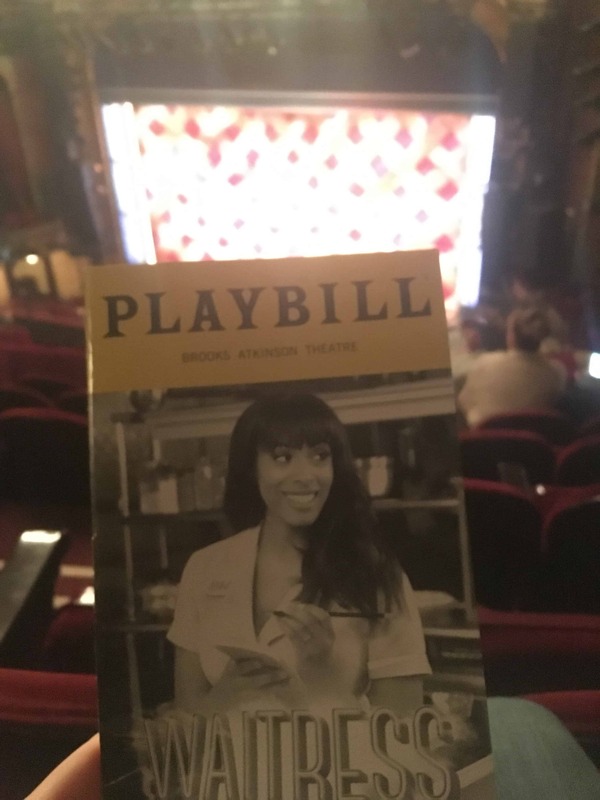 After dinner we headed to another Broadway Show, Waitress. To save money on this show we bought our tickets using TodaysTix. We had half a day on Sunday before needing to catch our plane. 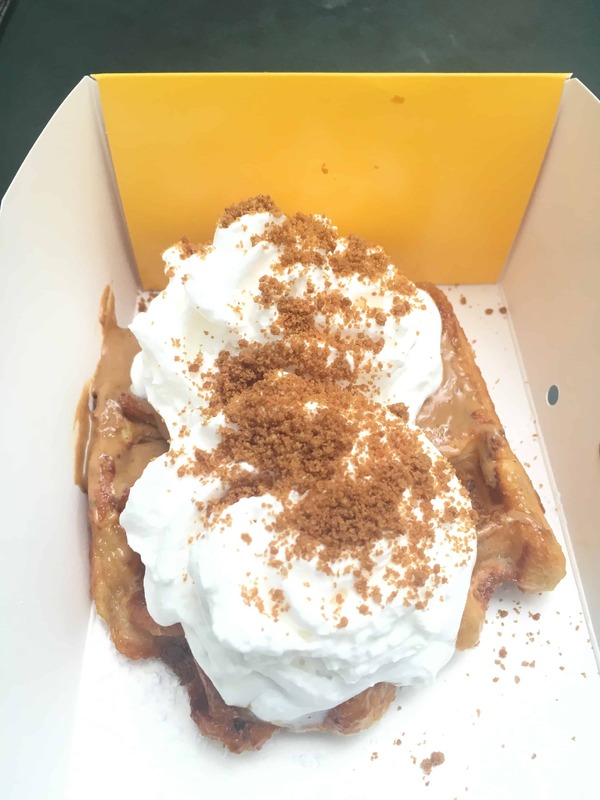 Breakfast was at Wafels and Dinges. 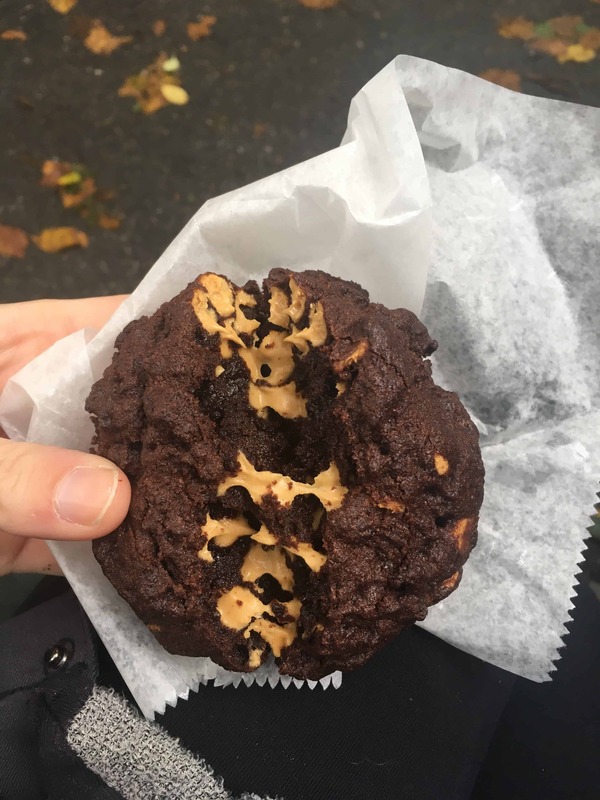 Which is absolutely delicious, and a MUST stop when in New York City. 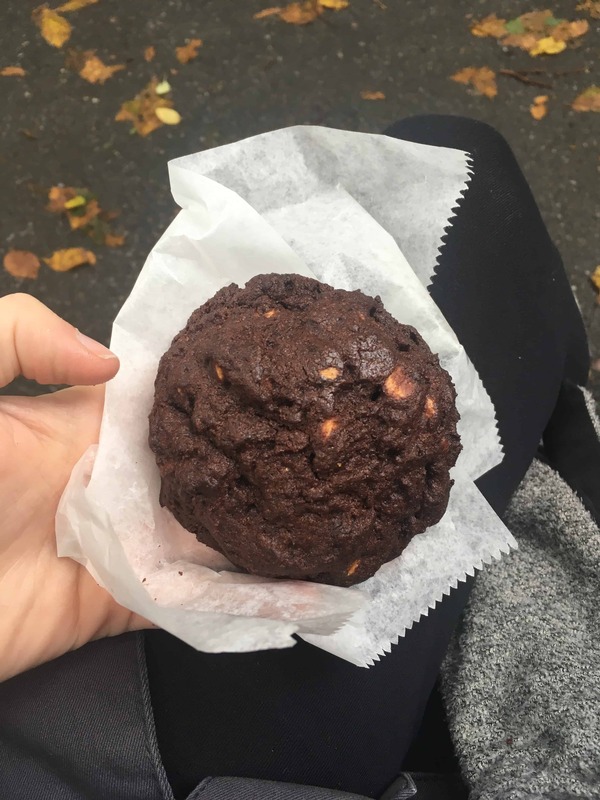 Following my sweet tooth we went straight from breakfast to Levain Bakery for the absolute BEST cookie I have EVER had!!! You MUST, I repeat, MUST stop by Levain Bakery. Their cookies were absolutely amazing! 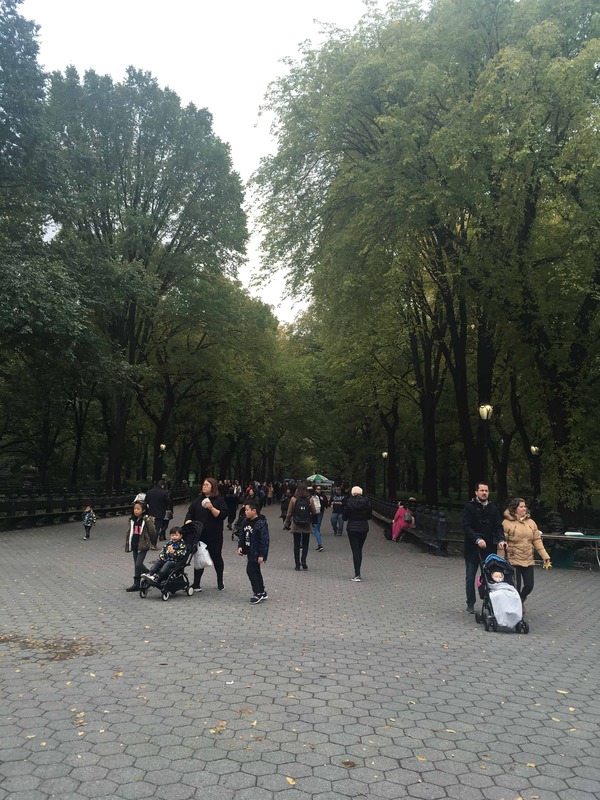 We ate our cookies in Central Park and then spent the rest of the morning wandering the paths and enjoying the day. 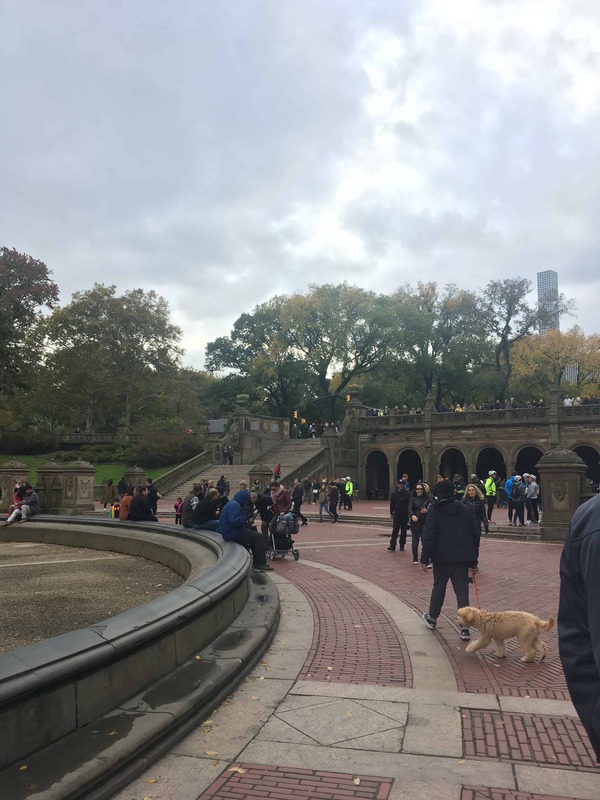 It truly is a beautiful park with so many unique areas and sights. I loved strolling through all of the different areas. Our trip was a busy whirlwind, but I wouldn’t change anything! We were able to see everything we wanted to see, and had a lot of fun doing it! I can’t wait to go back again one day and visit even more of the amazing sights. 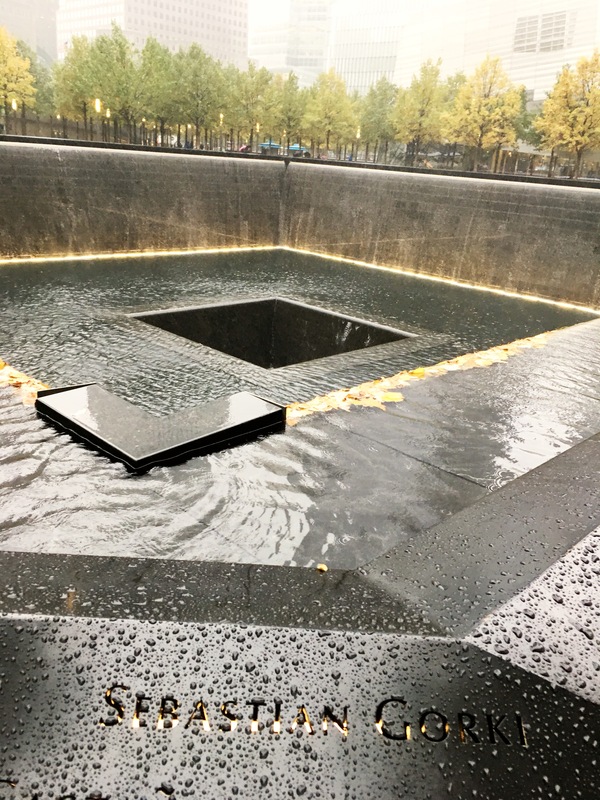 Be sure to check out my post 20 Completely Free Things to do in New York City for more budget friendly New York City ideas! 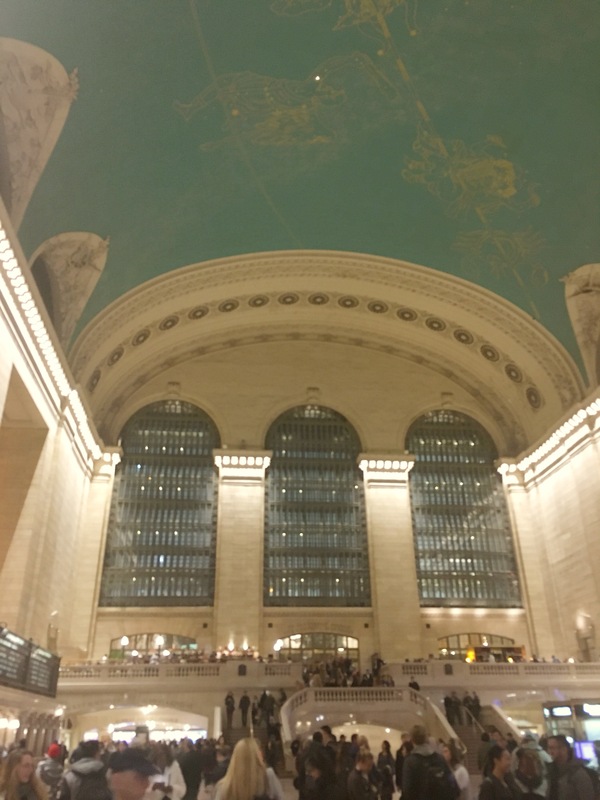 I love travel guides and I love NYC! 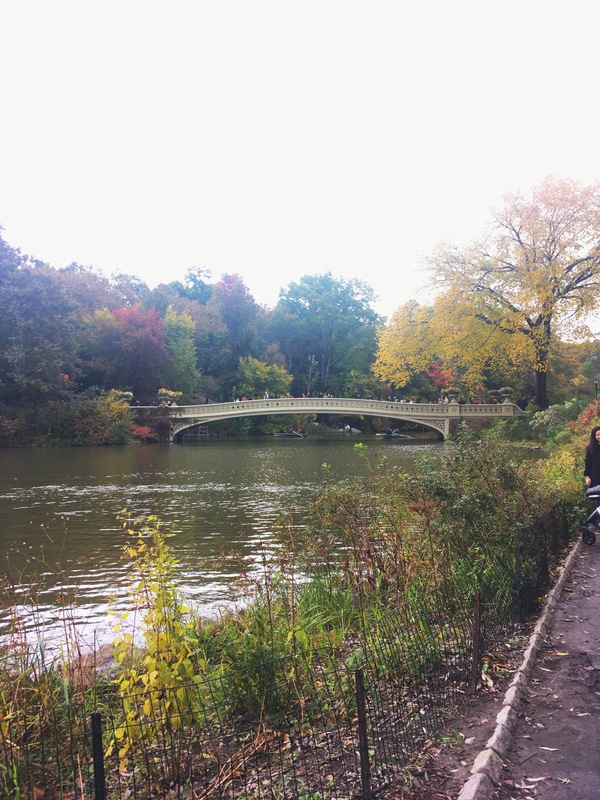 You’ve shared a lot of awesome ideas for spending only one weekend in such a big city.